The Ring is 18K White Gold (stamped 18K). The Ring is set with 6 Round Brilliant Cut Diamonds weighing appr. 0.12 Carat in total, Clarity SI, G-H Color, Good Cut. The top of the Ring is Mate finished (brushed), the bottom is bright polished. The embrace ring is made from recycled 14k white gold. This ring includes a very sweet sparkly H color, SI clarity, round brilliant diamond of. 10 carat weight. The band is a 2mm band. The ring weighs 2 grams of 14k white gold. Purity 10k. Hallmarked 10K. Secondary Stone Pearl. Carat Weight 0.20 ct. Main Stone Diamond. Shape Round. Shape Sphere. Color Cream. This 10k white gold oval white topaz and diamond ring features a 5x3 mm genuine natural white topaz with a 0.23 ct total weight and. 01 ct diamond accents. Setting：Pave & Prong Setting. Shape：Round Cut. Ring Size：6.5 (resizable). ★Side Stones：100%Genuine Sapphires. Total Gram Weight：1.8g. Total Carat Weight：0.23ct. Width Top：5.94mm. Size：3.5X3.5-4.5X4.5mm & 2.7X2.7-3.5X3.5mm. The Ring is a size 5.75. The Ring weighs 8.6 grams. This is to protect both parties. This 10k white gold oval opal and diamond ring features a 6x4 mm genuine natural opal with a 0.19 ct total weight. This 10k white gold oval rhodolite garnet and diamond ring features a 5x3 mm genuine natural rhodolite garnet with a 0.23 ct total weight. 14k White Gold Wedding Band Ring Set with. 14k White Gold Wedding Ring's Set with. 1=.05ct Round Cut Natural White Diamond &. 5=.05ct Round Cut Natural White Diamonds. 1=.05 Round Cut Natural White Diamonds &. Twin City Gold is pleased to offer this lovely ring. This ring features approximately 1/5cttw of single cut diamonds set in this two toned band. This ring weighs 2.7 grams. It is currently a size 7 1/4. It measures 11mm North to South and stands 5mm off the finger. Please be sure to view all photos! Feel free to contact us with any questions. Browse our other listings to find great deals on estate jewelry, diamonds, coins, collectibles and more!. Material: 14k White Gold. This ring was handmade and as such displays irregularities of design that give it wonderful character (for example, the soldering on the underside of the ring isn't perfect). This glamourous 1CT. Pear Shape Garnet cocktail ring. Round Diamond stones highlight the deep center stone. Set in 14k gold. 1CT Garnet. Beautiful Cluster Ring of Garnetand Diamonds.07 ct Diamond. Cut - Round Brilliant. Main Stone:Diamond. Gemstone - Diamond. Gold Finesse - 14kt/585 White Gold. Material:White gold. Ring size - 7.25. Material Fineness:14 kt gold. Total Weight (in g):3.1. Elegant channel setting toe ring featuring sparkling brilliant cut created diamonds totaling 0.24carat. Ring is crafted from solid 14k gold with high polished finish. Type: Created Diamond | Simulant. Free Ring Sizing. Best of luck! It is a White Gold size 9 ring. It has 0.24 Ct of Diamond. And it has nice white color on two sides where the diamond is located, which gives a classical look. The Ring is a size 5.25. The Ring weighs 1.7 grams. This is to protect both parties. 14K -. 585. Since, we were created on a foundation of jewelers, based on jewelry repair. We specialize in jewelry sales, repair, and customizations for any and all types of jewelry. Cut: Round Brilliant. DIAMOND WT - 0.20 CARAT. DIAMOND COLOR - Hi. Natural PearJade 7.5mmx11mm = 1.93 CT. Round Cut 0.21 CT. Diamond Information. Here is a stylish 14k White Gold Ring from the talented designers and jewelers at Kabana. All Kabana styles are still painstakingly created in the USA. This ring is from the collection of a retired Kabana dealer. Vintage Modern 14K White Gold & Diamond Flower Ring, Very Fine! Hallmarks: 'S' inside of crown and 14K. The vivid diamond is pointed on a center. Diamond: 1x round cut, 0.06 CT, VS quality stone. Good luck ! The inner and outer sides have different finishes : outer side has mate finish, innner side -gloss finish. Diamonds: 0.07 ct G-H /SI1 Tanzanite: 5mm x 3mm approx. Stamped: 14k. Every piece will be professionally cleaned and polis. 1 round diamond. 12ct. 10.23mm wide front face of ring (across top to bottom). Total Diamond Weight. 3.57mm wide back shank (most narrow area of the band). Diamond Information. Photos have been enlarged to show detail. 1 marquise lab created opal 6x3mm. gemstone diamond ring. 6.05mm wide front face of ring(across top to bottom). 4.06mm wide back shank (most narrow area of the band). Diamond Information. Gram Weight. This Ring is a Size 8.5 and can be sized to fit you. 10k Solid White Gold Diamond Mother Pendant !! Wearable and Marked !! Beautiful 10k Solid White and Yellow Gold and Diamond Mother Pendant ! 19 small Diamonds, 0.20ct Diamonds ! Weighs 3g ! Wearable and Marked 10k and tested to 10k ! Be Sure to check the pictures closely and judge for yourself ! 10kt White Gold. 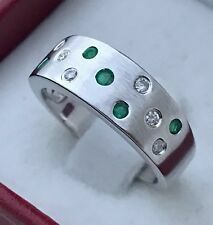 Diamond Color Ring Size White Gold. Main Stone Shape Multi-Tone Gold 10k. Subject To Credit Approval. Gold Purity & Color. 5 round single cut diamonds. 05ct. center round diamonds. 19ct. Jewelry Type. Diamond Information. 5.84mm wide (top) 5.25mm wide (bottom). Resizing and Fees. Pear shape tanzanite 6x4mm. Diamond gemstone ring. Diamond Information. Photos have been enlarged to show detail. Resizing and Fees. 10kt White Gold. Diamond Color Ring Size Main Stone Shape white Gold, 10k. Color: White. White Gold, 10k. Subject To Credit Approval. STONE 9 mm Pearls, 0.20 Ct H SI1 Baguette Diamond. We are constantly adjusting our prices to stay ahead of the competition. LENGTH 3 mm wide. THICKNESS 1 mm. STYLE Cocktail. WATCHES PARTS. CONDITION Pre-owned.